Have a 2009 District of Columbia quarter? If so, then you probably want to know if it’s one of the few Washington DC quarters with errors — and how much your DC quarter is worth (whether it has errors or not). Read on to find out if your 2009 District of Columbia quarter is one of the scarce and valuable ones with a doubled die error. First, check the back side (or “reverse”) of your District of Columbia quarter. That’s where you’ll find the likeness of 20th-century musical icon and Washington, DC native Duke Ellington. The jazz virtuoso composed such hits as “Take The A Train” and “It Don’t Mean A Thing (If It Ain’t Got That Swing)” and was a recipient of the Presidential Medal of Freedom in 1969. 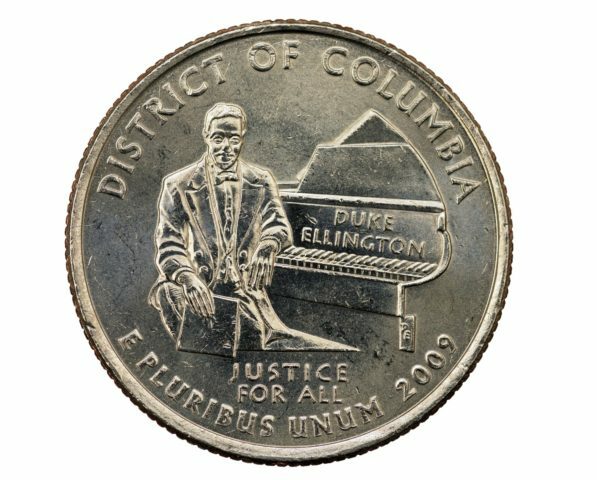 Duke Ellington’s name is emblazoned on the piano he’s sitting at on the reverse of the 2009 Washington DC quarter. Some 2009-D District of Columbia quarters exhibit doubling in the “ELL” of “ELLINGTON.” To date, only a dozen or so with drastic doubling in the “ELL” have been graded by the major third-party coin certification firms. Other 2009 Washington DC doubled die quarters show minor doubling in places such as Ellington’s arm and in some of the keys of the piano. How Much Are Doubled Die 2009 District of Columbia Quarters Worth? Some examples of the 2009 Duke Ellington quarter with doubled “ELL” have sold for 3 and 4 figures, trading for $1,000 or more. But prices are all over the board — depending on the magnitude of the doubling and the coin’s condition. The 2009 Washington DC quarters with minor doubling on Ellington’s arm and in the piano keys are much more common. They typically sell for $5 to $20 apiece — based on the degree of doubling and the condition of the coin. How Much Are Regular 2009 District Of Columbia Quarters Without Errors Worth? District of Columbia quarters were the first of 6 different issues struck in the one-year-only DC & US Territories Quarters series. The 2009 DC and US Territories Quarters immediately followed the 50 State Quarters program of 1999 through 2008 and preceded the America The Beautiful Quarters series that began in 2010. As you can see, tons of Washington DC quarters were made, and most of these entered circulation. So, circulated (or worn) 2009 Washington DC quarters that don’t exhibit any signs of errors or other oddities are extremely common and are worth only face value — or 25 cents. But if you have an uncirculated District of Columbia quarter that was never spent as money, it’s worth more. Uncirculated 2009 Washington DC quarters are worth about 50 cents and up. What about proof Washington DC quarters that were made at the San Francisco Mint (“S” mintmark) for collectors? Copper-nickel clad proof Duke Ellington quarters are worth about $1.25 apiece and up, while 90% silver proofs trade for $4 or more. There’s some neat stuff behind these popular 2009 Washington DC quarters. Here are a few cool facts you can memorize to build your numismatic knowledge and impress your friends! Duke Ellington’s appearance on the 2009 quarter is historic. He became the first African American to appear solo on any circulating US coin. Curious about the other African Americans who preceded Ellington on US coins? In the 1940s and ’50s coins began bearing the likeness of George Washington Carver and Booker T. Washington — they’re commemorative coins, and neither was designed to circulate. In 1997, baseball icon Jackie Robinson appeared on a $5 gold commemorative coin. The first black person to appear on circulating US coinage was a slave named York, who is seen on the 2003 Missouri quarter also depicting explorers Lewis & Clark on their Corps of Discovery expedition across America. The Duke Ellington quarter design was made by Don Everhart, whose credits also include 50 State Quarters honoring Nevada, New Mexico, and Hawaii; the obverse (“head’s side”) of 2005 Westward Journey nickels; and the Professional Life 2009 penny of the 4-piece Lincoln Bicentennial cent series. Some District of Columbia officials wanted the Washington DC quarter to bear the famous slogan “Taxation Without Representation” or “No Taxation Without Representation” — which in this case refers to the controversial situation in that District residents have to pay federal taxes yet don’t have any representation in Congress or the Senate. Duke Ellington wrote thousands of songs over his long career but never formally recorded his first song, a 1914 ditty called “Soda Fountain Rag” — a song he played only on rare occasions.